Stanley Jones, printmaker and lecturer, born in Lancashire. After studying art at the locak art school , he continued his studies at the Slade School of Art. He was awarded several scholarships, one from the Slade and the Robert Ross Scolarship. From 1956-1958 he worked at the École des Beaux-Arts in Paris and with the help of S.W Hayter , joined the staff team at the Atelier Paris. It was there that he was introduced to many Parisian artsist such as Braque, Severini and Giacometti. In 1958 he returned to England and set up a lithographic Studio to be run by the Curwen Press . The Curwen Press lithographic studios became well known and printed for many major British artists. Most of their art work was printed by or under Stanley Jones supervision. At the Curwen press he developed the continuous tone process. 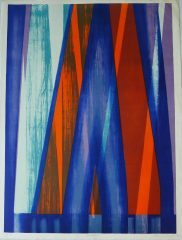 In the late 1950’ss he began to lecture on lithography at the Slade School of Art and he was the founder member of the Print Makers Council in 1964. In 1965 he helped to open the Curwen gallery, which is still running today.He was participated in the ‘Artists At Curwen’ show at the Tate in 1977. In 1989, Curwen moved to Chilford Hall and renamed Curwen Chilford Prints. Today is still holds classes to teach print making. Stanley Jones has just published his autobiography entitled “Stanley Jones and the Curwen Studio”, published by A & C Black.